13 nights - Comfort Hotel. 1 night - Sleeper Train. 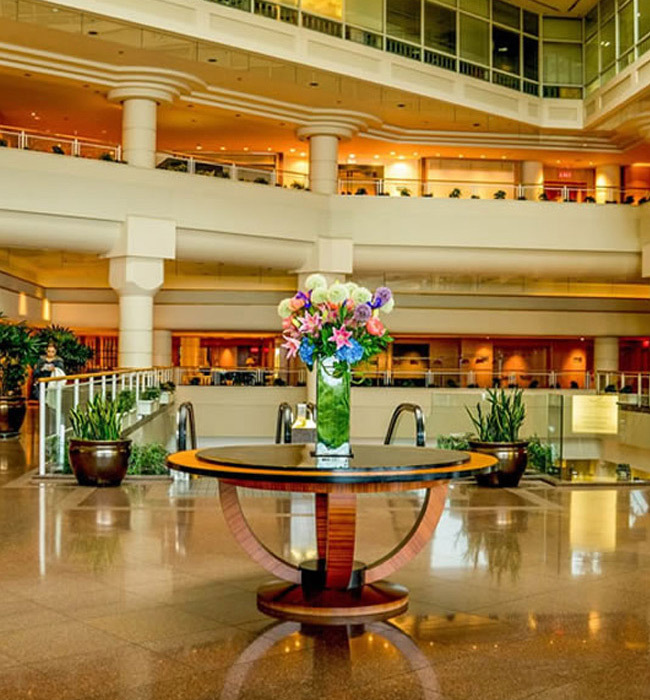 Our EMBAH Tour leader will welcome you at Cairo international airport and accompany you on the group transfer to the center of Cairo and check-in hotel. Free at leisure with a choice of optional tours in the case of early arrival. Dinner and overnight at hotel. 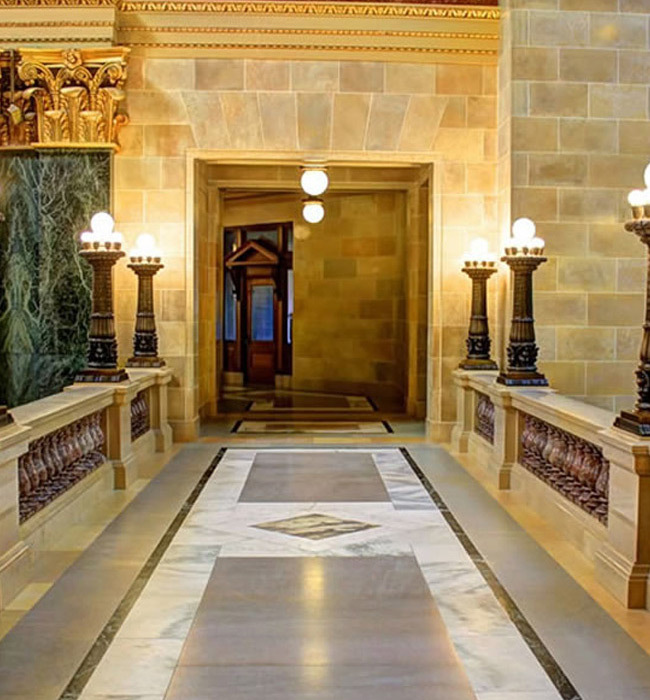 Morning visit to the Egyptian Museum of Antiquities in Tahir Square to learn about the history of ancient Egypt and marvel at the 107 halls filled with artifacts dating from the prehistoric through the Roman periods. Your guide will take you through the spectacular Tutankhamun collection and you will have a chance to view the perfectly preserved royal mummies housed in glass cases (extra charge). 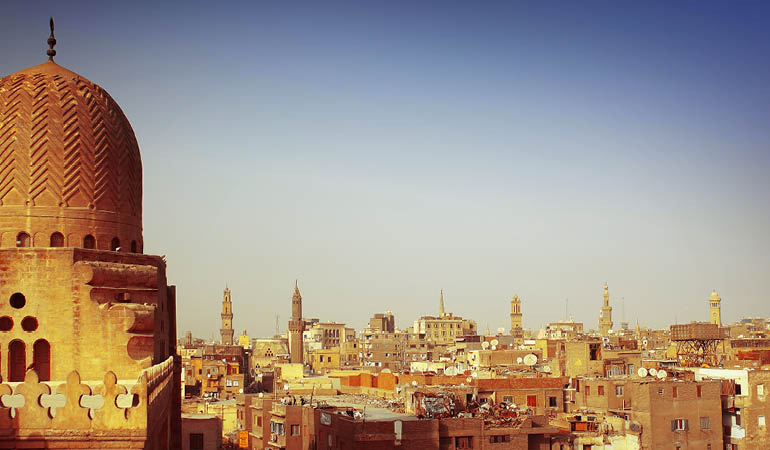 Free time in the afternoon to explore further or try a bit of haggling in the famous Khan el Khalili market, wander around the busy streets, sit in the famous Feshawy café and watch the world go by or visit one of the many beautiful mosques. Overnight at Cairo hotel. 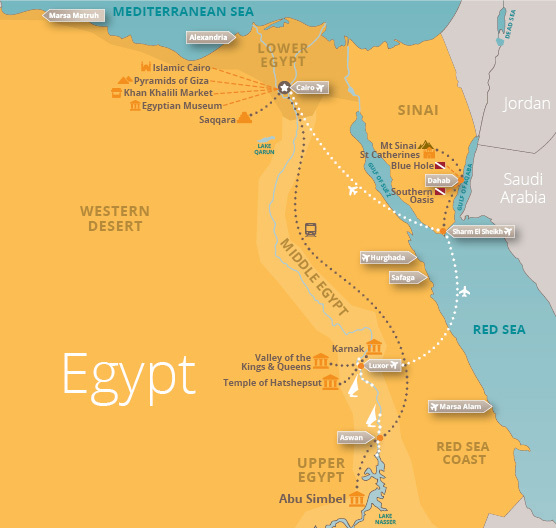 Visit the Great Pyramids of Giza, walk around these ancient wonders, take a camel trek (optional), go inside the Great Pyramid (optional), but be warned the passageways are hot, humid, narrow and quite claustrophobic. 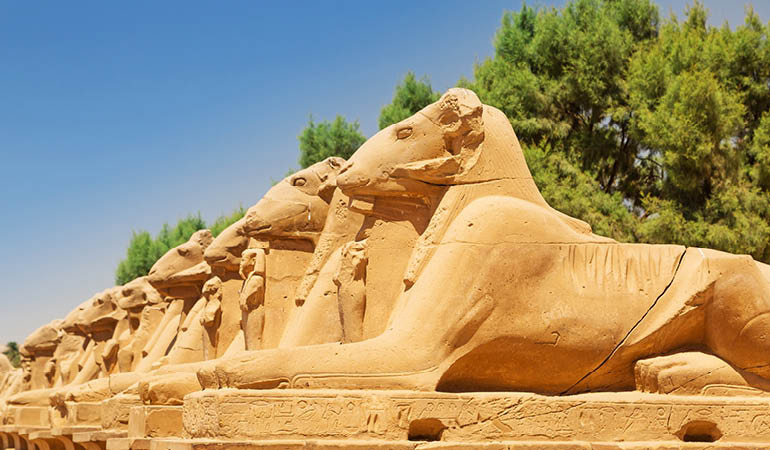 Enjoy panoramic views of this great city and pay a visit to the ever enigmatic Sphinx. Lunch is served in a nearby restaurant before we head to the oldest pyramids in Egypt at Sakkara (2hrs). Return transfer to your hotel. Free time this evening until you take the overnight sleeper train to Aswan. 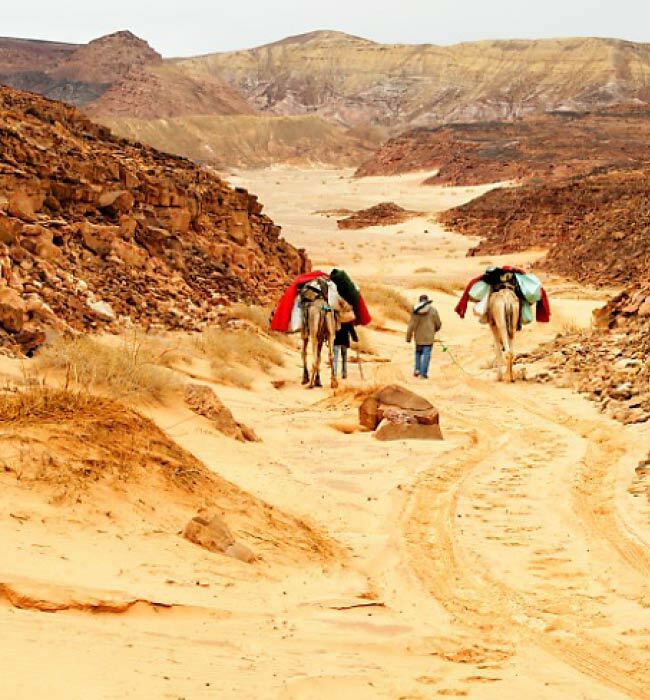 Arrive in Aswan and transfer to your hotel. 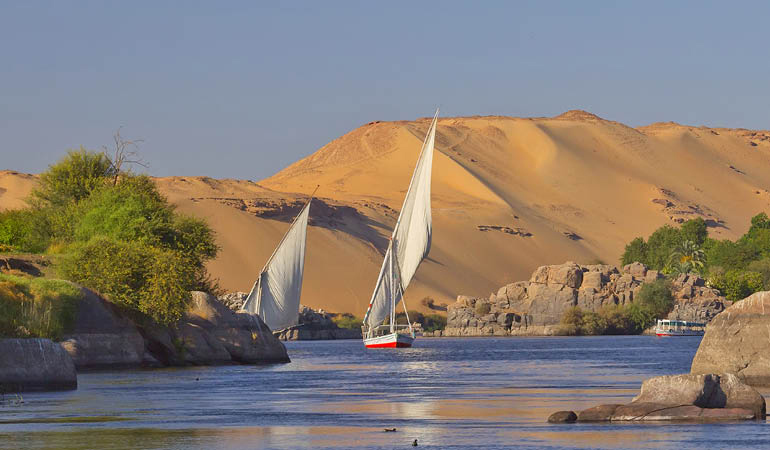 Free day for you to relax and catch your breath or meander around the streets sightseeing or set sail down the River Nile on a traditional felucca boat (extra charge). In the evening you will take dinner in a traditional Nubian home with the local Nubian people before retiring to your hotel. 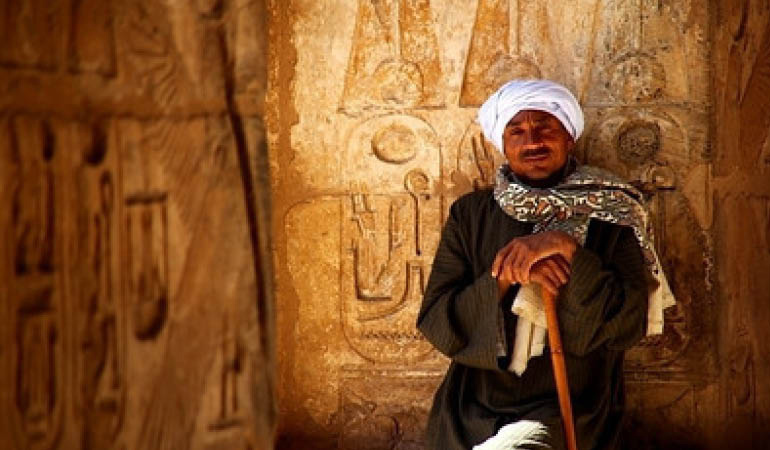 Full day sightseeing in Aswan with your guide. Free night for relaxing or dining out. Overnight in hotel. walk around a local market where you can try your skills at haggling and enjoy some friendly banter with the locals. Free day with optional visit to the magnificent Abu Simbel temples. Early 3am pick up for the drive to Abu Simbel which is approximately 300km from Aswan. 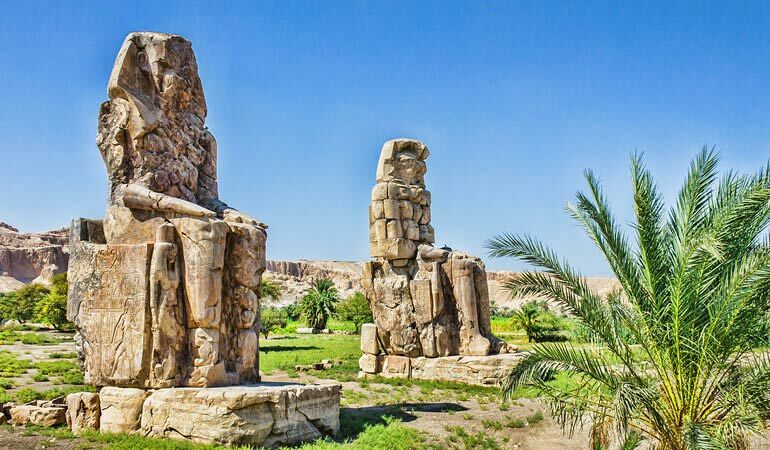 The twin temples are located on the westren bank of Lake Nasser which is part of the UNESCO World Heritage Site known as the Nubian Monuments. Marvel at the sheer size of these magnificent temples that were hand carved out of the mountainside as a lasting monument to Pharaoh Ramesses 11 and his Queen Nefertari. Overnight in the comfort of your hotel. Morning transfer to Luxor. 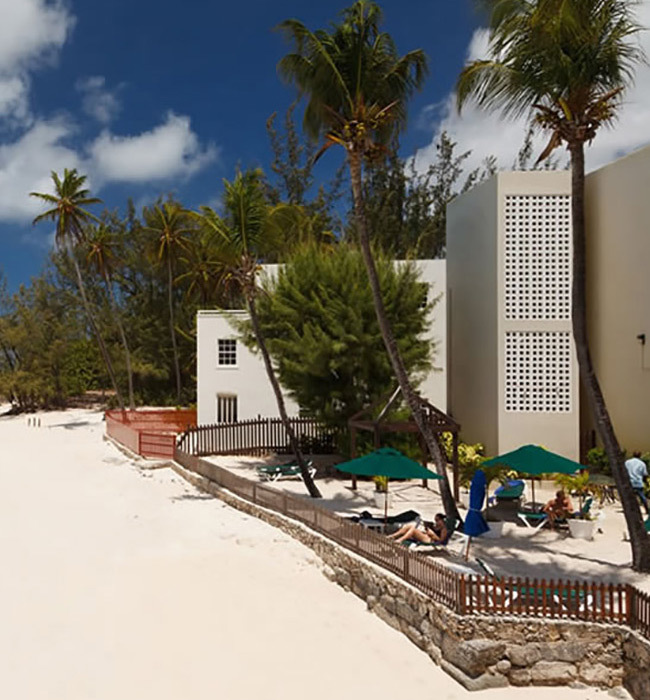 Check in hotel with free time this afternoon to explore at your own pace or book one of our excursions or activities. There are many shops and bazaars if you want to search for souveniers or head to the promenade to sit by the waterfront and watch the world go by. For the more adventurous traveller take to the skies with a hot air balloon flight over the Valley of the Kings. Dinner and overnight at hotel. Full day sightseeing in Luxor on the Westbank. 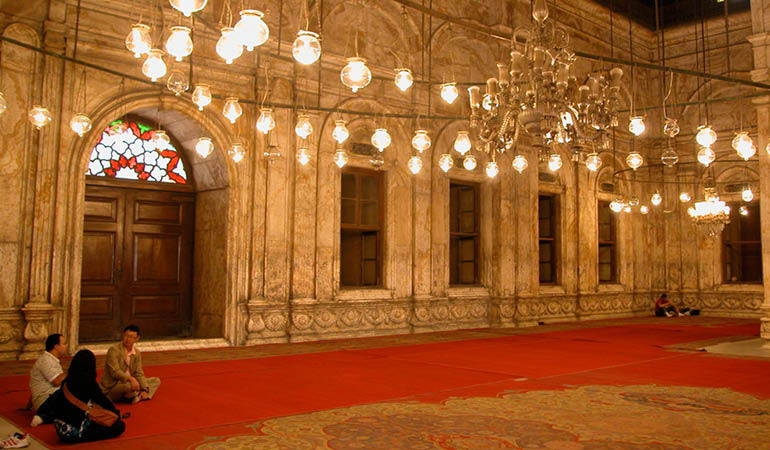 Step back in time and travel by doneky to discover the famous site of the Valley of the Kings and Queens. 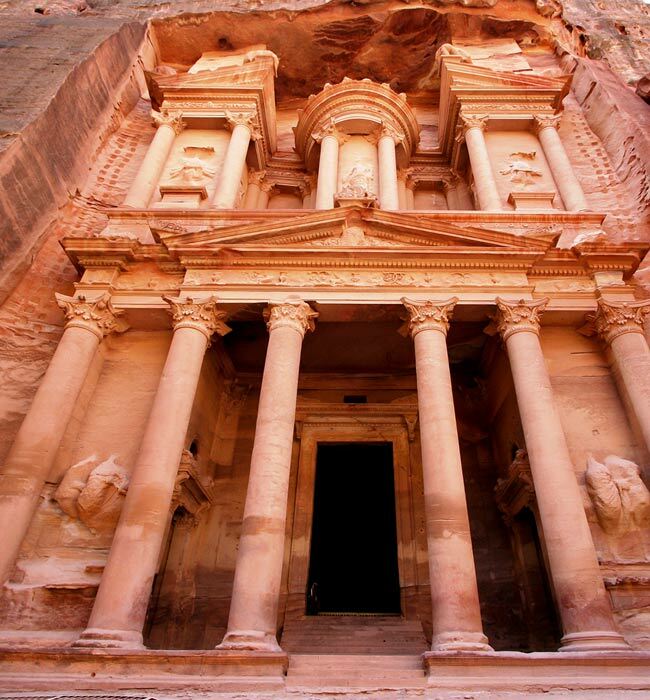 There are 63 known tombs which differ dramatically in size, from a simple pit to complex tombs boasting 120 chambers. Explore these ancient tombs before heading back over the river to visit the beautiful funerary temple of Queen Hatshepsut, Egypt’s first female Pharoah. Dinner and overnight in hotel. Full day sailing down on a traditional Felucca boat. Relax and cruise along the River Nile passing farms with lush green fields ploughed by oxen and horse drawn carts filled to the brim with the day’s harvest. Wave to fisherman in their small boats using traditional fishing methods that have remained unchanged throughout the centuries. Transfer to Luxor airport for the evening flight to Sharm el Sheikh. Our EMBAH tour leader will meet you at the airport and accompany you on group transfer to the Red Sea Resort of Dahab. Check in and overnight at Dahab hotel. Today you are free to relax or explore at your own leisure. 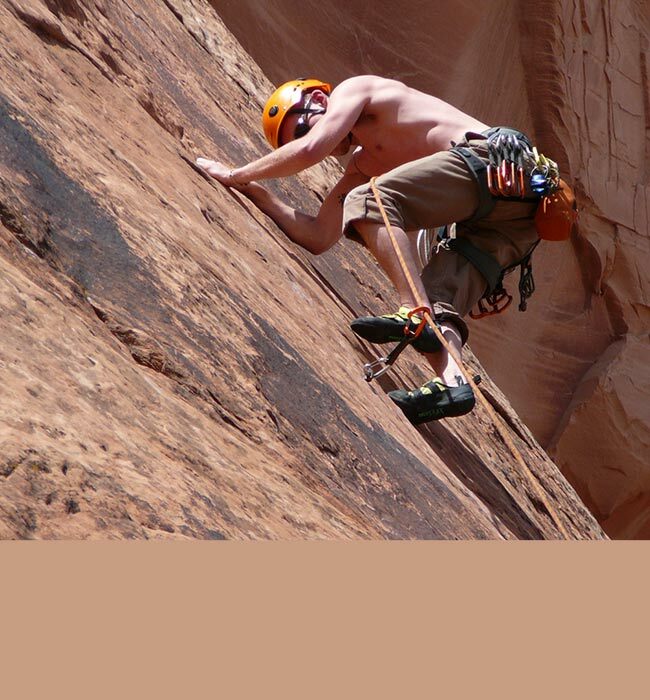 We offer a host of activities to suit all tastes from sea kayaking to rock climbing. Discover the fascinating underwater world of the Red Sea with an intro dive. The session includes theory and briefing with an equipment overview and underwater session to a maximum depth of 12m (3hrs). If you enjoy your intro dive why not take one of our PADI certified courses available at our dive center. For experienced and certified divers we can organise dive safaris to the many amazing sites around Dahab, including the infamous Blue Hole. Overnight at Dahab hotel. Choose to relax by the pool with a cool drink and a good book or take advantage of our wellness progamme with yoga and meditation classes on the beach. Pamper yourself with a wide range of beauty treatments and a soothing massage from highly trained and certified professionals. 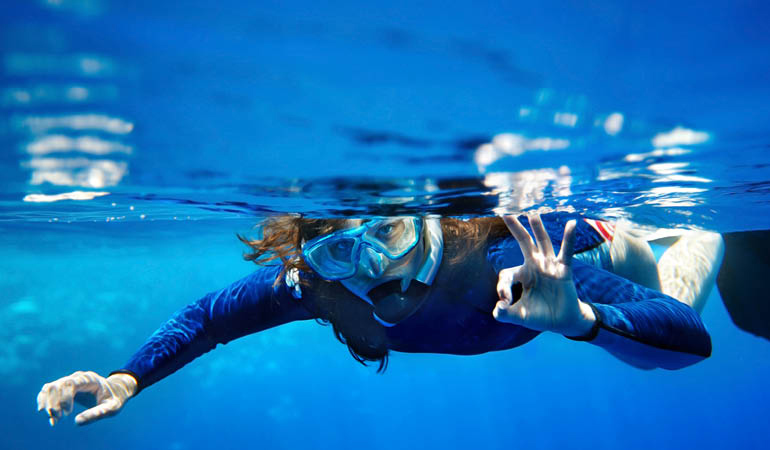 Options to go snorkeling at Gabr el Bint or horseriding along the waters edge to the beautiful lagoona. Overnight at Dahab hotel. 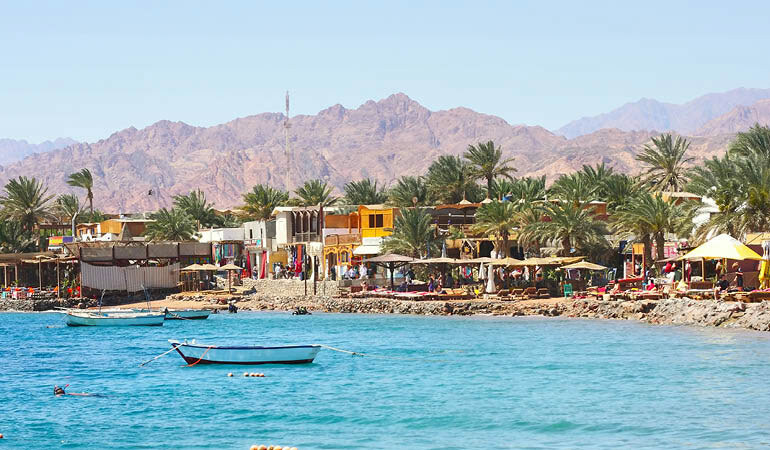 Dahab boasts some of Egypt’s most spectacular reefs for diving and snorkeling along with its golden sandy beaches and rugged mountain backdrops. Enjoy a full day snorkeling in the Southern Oasis, a remote pristine area with a huge variety of colourful marine life and coral. 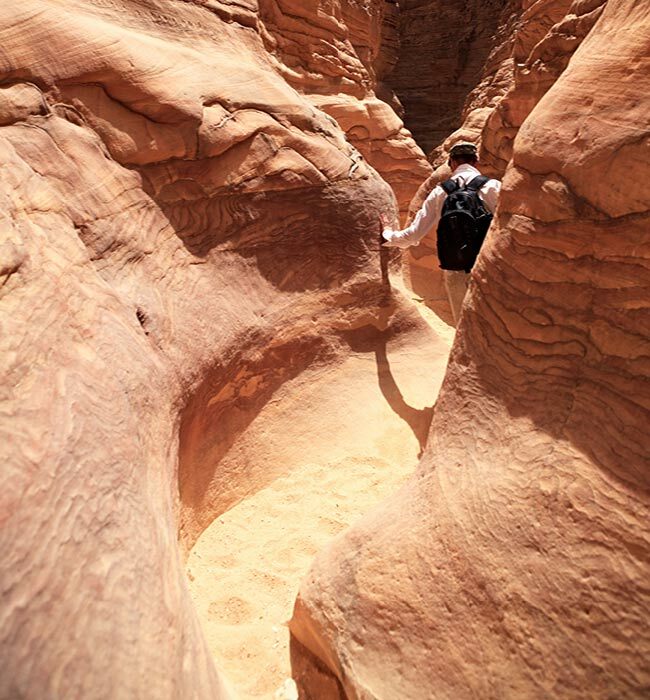 Alternatively take a trek into the Sinai Desert or visit Moses Mountain and St Catherine’s Monastery. In the evening to explore Dahab with its many cafes and restaurants along the waters edge. Overnight at Dahab hotel. Another day spent at your leisure. Why not try our watersports day at the lagoon taking a ride on the banana boat or stay dry and view the reef from the glass bottom boat. For an adrenaline rush try your hand at kitesurfing, windsurfing or quad biking. Overnight at hotel. Relax around the hotel pool or venture out to the many bazaars along the seafront for last minute souvenier shopping. 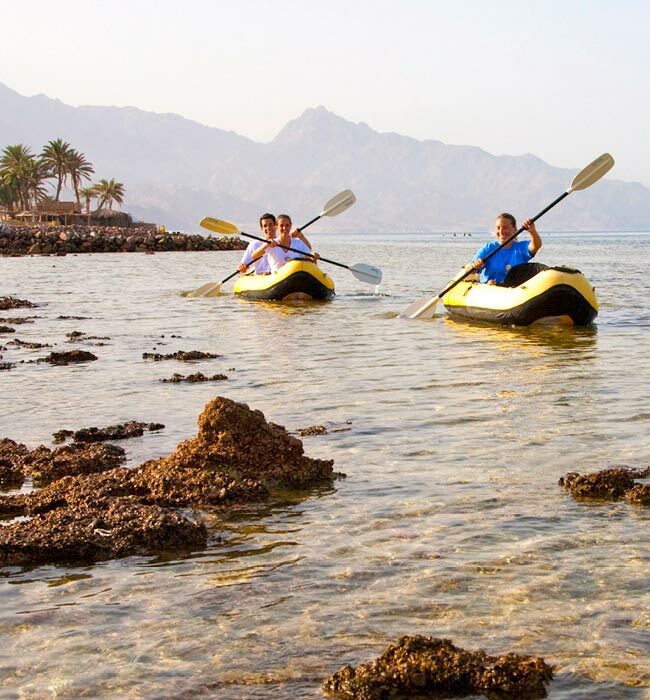 We recommend taking a coastal camel trek to Ras Abu Galum where you can snorkel in the pristine waters. 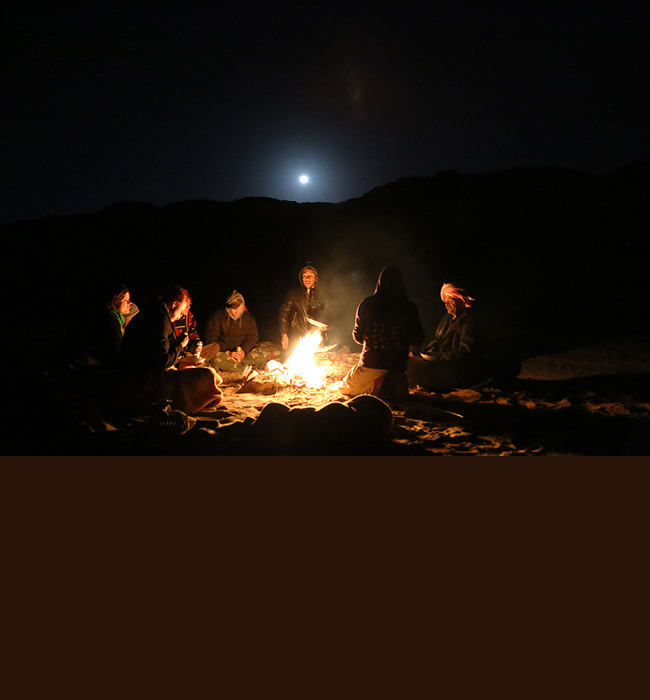 Farewell Bedouin dinner in the mountains cooked on the campfire using only the freshest local ingredients. Overnight Dahab hotel. Free time until your transfer to Sharm el Sheikh International Airport for you flight home.